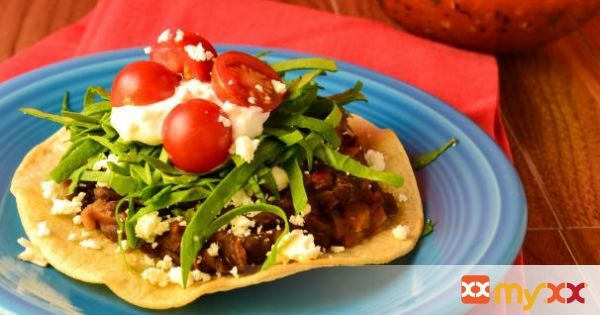 Quick and easy tostadas with spicy black beans and your favorite condiments! 1. Heat a large saute pan on medium high heat. Saute your onions and garlic in olive oil for 2-3 minutes. 2. Place your black beans (BB) in a microwavable safe container and add the sauteed onions and garlic to the BB. 3. Add the diced chilies in adobo sauce to the BB. Sprinkle in some dried basil and garlic sea salt. Stir and microwave for 2 minutes, using a potato masher mash the warm BB to your desired consistency and return to the microwave for 1 minute. 4. Meanwhile take a paper towel and using the same saute pan wipe out any excess oil or browning from the onions. Spray with cooking oil and on high heat, toast your tortillas until crispy anywhere from 5 to 10 minutes.